What are the 2 types of monthly tides? Which tide results in a larger water bulge? Which tide results in a smaller water bulge? How many high tides are there a day? How many low tides are there a day? Which type of tide would you expect to see during a full moon? 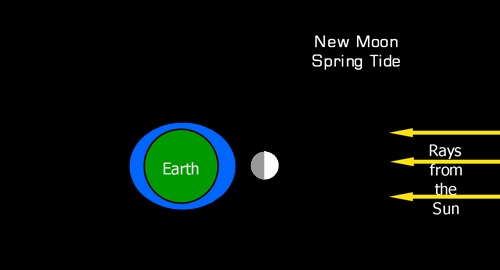 Which type of tide would you expect to see during a new moon? Which type of tide would you expect to see during a 1st quarter moon? Which type of tide would you expect to see during a 3rd quarter moon? Why do we have tides on Earth? because of the Moon's gravity pulling on the Earth's oceans.